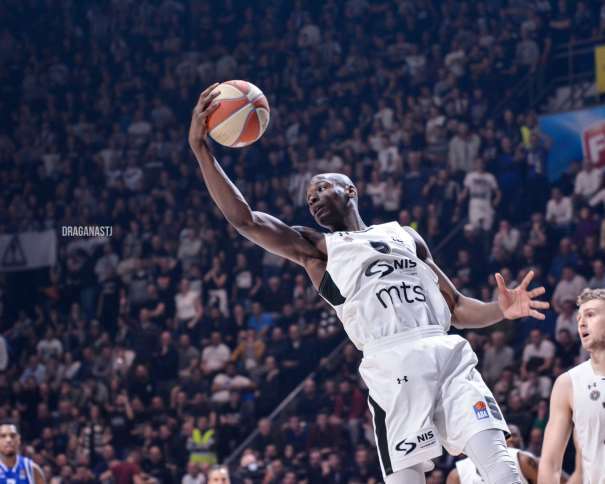 In the ABA League Round 18, Partizan won 76 – 67 against Budućnost in a packed Aleksandar Nikolić Sports Hall (also known as Pionir). 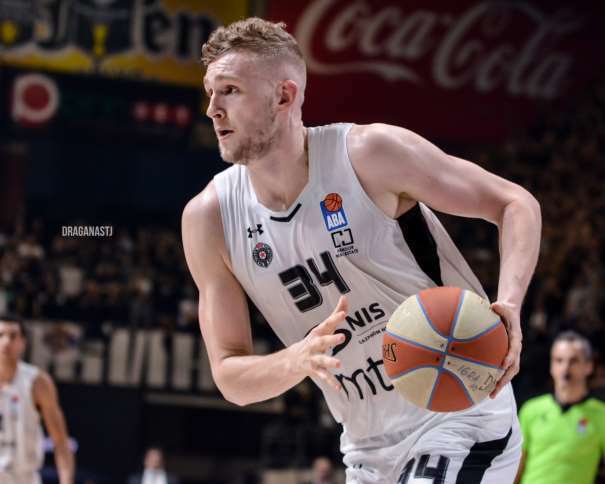 With this win the Black and Whites have the same number of victories as Budućnost, but with a scoring advantage (in the first matchup, the team from Podgorica won 75 – 71). Andrea Trinchieri’s squad were controlling the game from the first till the last second. The Guests were trying to get closer but the home team rejected their attacks. They showed a very mature game, like they have years of experience in playing such important matches. Also, the hosts were playing without two important players who skipped the game due to injuries. Rade Zagorac and Aleksej Nikolić set this match and their teammates responded excellently. 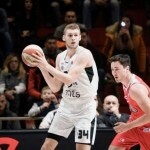 Budućnost was complete from the beginning of the match but Goga Bitadze, the best center of the team, was injured after only less than four minutes on the court. He suffered from a leg injury and it is still unknown for how long he will be out. The Montenegrin team will probably search for another big man in order to stay in the run for the better spot in the Playoffs. 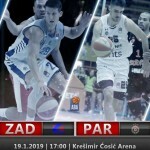 For now, the Black and Whites have better chances to stay the third and they will try to attack Cedevita and the second place because Crvena Zvezda will keep the first spot. The Win against Budućnost allowed the Serbian team to dream bigger, and mostly thanks to an excellent Jock Landale. Maybe he had one motive more because his parents came to Serbia and will stay till the end of the season. The Hero of the match scored 23 points and had three assists for an index rating of 25. 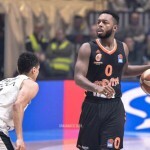 His teammate Nikola Janković added 12 points, 3 rebounds and 3 assists (index rating of 17), while Bandja Sy had 9 points, 6 steals, 5 rebounds and 2 assists (index rating of 17). Alex Renfroe, the best assistant in the squad, finished the match with 10 points and 11 assists (index rating of 12). After the match, Landale was more than happy for the team win. And his teammates praised him especially because before the game, he had a strong migraine. The Australian player didn’t want to mention that but his captain Novica Veličković explained it to the journalists. “Ask his about the migraine he had before the match. You all have to know under which condition he was playing, and what he did on the court. He is amazing”, said Novica in Serbian. “Yes, I had a migraine, and it was strong this time. Before the match, when we were on the court, before the match I couldn’t see on my left eye. That happens sometimes, once a year and this time it happened one week ago and today. I had to take medications and now I am ok”, said Landale who was very happy his parents came in Belgrade. “My mom was here before, but this is first time for my dad to be here. And he is basketball fanatic. I will have to ask him about his impressions, but I think he loved the crowd”, mentioned the Australian player who didn’t pay attention about how much points he scored. “I was just shooting, and guards helped me a lot. They were finding a ways for me to score, I am very thankful. They read different situations very well and they included me in all that. Also, when Stefan (Janković) missed dunk attempt, while he was falling on the ground he saw me and passed me the ball. It was amazing and I used given opportunity”, added Janković who thinks that this was mostly a team win because they were communicating great in defense. “I think we played the best defense from the beginning of the season. We had great communication on the court, and we read our opponents. We were on their trails during the whole game”, finished Landale about the game against Budućnost. The Next challenge for Partizan will be The Radivoje Korać Cup, from February, 14th till 17th and the team is defending the title from the last season. 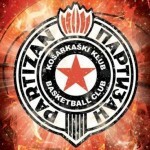 The Black and Whites will start to prepare for their first opponent OKK Novi Pazar. “The squad will go step by step, and won’t think in advance about the Internal Derby. We will try to prepare the best we can and from tomorrow we are thinking about our first opponent”, finished Landale.